Infiniti is getting ready to unveil their latest crossover, the JX, at Pebble Beach this August. A production vesion of the 2013 model will debut at the upcoming Los Angeles Auto Show in November. Infiniti is preparing to unveil its latest crossover concept at Pebble Beach Concours d&apos;Elegance on August 18th. To build some hype for the new vehicle, the automaker has been releasing a few teaser shots online. Called the JX, it will accompany the EX and FX models in Infiniti&apos;s crossover range. The seven-seater will show the brand&apos;s continued evolution and will be derived off the FX and the Etherea concept. 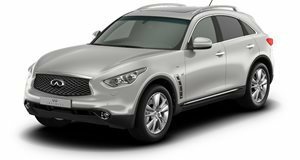 Infiniti assures buyers of "a stunning interior" that is set to rival the Mercedes-Benz ML-Class and BMW X5/X6 models. There may be a chance that Nissan will include its 3.5-liter VQ V6 which produces a comfortable output somewhere in the zone of 290 horses. A CVT may be the only transmission available. A production version of the 2013 Infiniti JX is set to make its debut at the upcoming Los Angeles Auto Show in November and will go on sale in the US in the spring of 2012.